Dustin Bissette (Class of 2008) attended Pensacola Christian College following high school and then enlisted in the U.S. Air Force in February, 2013. Dustin and his wife, Lindsay, have been married for two and a half years and currently have a nine-month-old son, Michael Joseph Bissette. 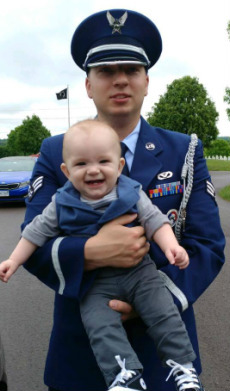 The Bissettes reside in Woodbridge, Virginia and Dustin is currently stationed at Andrews Air Force Base as a civil engineer with the rank of Senior Airman (E4). Thank you Dustin for your service to our country!